Andy Hart thinks of antler hunting as a process of manufacturing luck. Anyone can happen upon a single elk antler in the backcountry, but amassing a whole pile of freshly shed brown antlers takes something more. Hart, a biologist by training and stay-at-home dad from Laramie, will track an elk herd for days, months, years on end, learning their habits. In April and May, Hart heads out before the kids wake up to start his search for sheds in the dark and cold, hiking more than 20 miles most weeks. He says his single-minded obsession for finding antlers is proof he’s crazy but his wife says it keeps him sane. Andy Hart’s son, Gilbert, with a rare find—a matched set of elk antlers in close proximity. “As they lay” photos like this one circulate on Facebook and other social media. Photo courtesy Andy Hart. “It’s adventure. It’s a non-lethal trophy. Non-hunters are really sympathetic once they know you’re not selling bear paws,” says Hart. But shed hunters who are far more mercenary about the pursuit are also part of the population – and their ranks are growing fast. The men and women who hunt for sheds in the remote corners of Wyoming are part of a global marketplace. An antler plucked from a wind-blown spot outside of Pinedale may end up in a cup of tea in Pyongyang, Korea. Only a small percentage of the very biggest and prettiest antlers are used in the craft industry to make everything from knife handles to chandeliers that fetch upwards of $7,000. A slightly larger portion of the antler supply goes to pet chews. Rapid growth in that market has recently driven up antler prices (PetSmart sells a chunk of elk antler for $33) to a higher-than-average $12 per pound. But the majority of the West’s antlers go overseas. 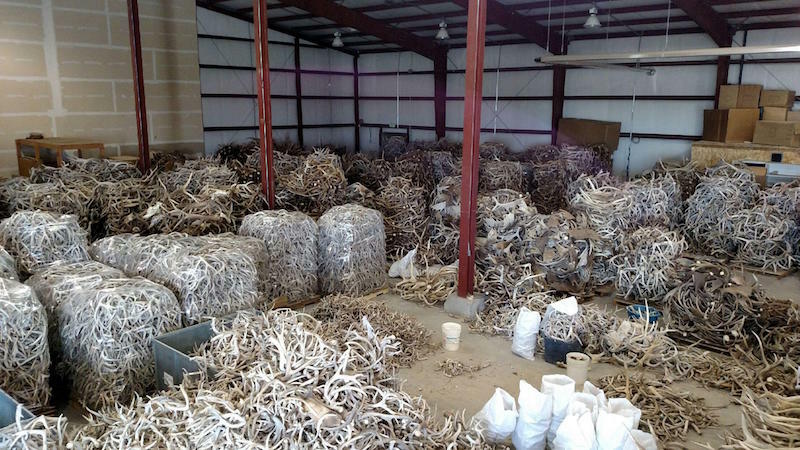 Once delivered to the Asian market, shed antlers are typically ground to powder and made into pills. Dr. Subhuti Dharmananda, Director of the Institute for Traditional Medicine in Portland, Oregon, says antler powder, or Lu Jiao, is an ingredient used to promote blood circulation, reduce swellings, and “tonify the kidney” in traditional Chinese medicine. Dried antler is distinct from antler in velvet collected from farmed animals, which is an even bigger market share. Velvet antler is used in Chinese medicine to treat impotence and other maladies. In the U.S., professional athletes use velvet antler as a steroid alternative and supposed performance-enhancing mouthspray. Workers at an Idaho warehouse sort the most expensive brown antlers from less valuable Number 2 antlers that have a bit of fading and cracking. 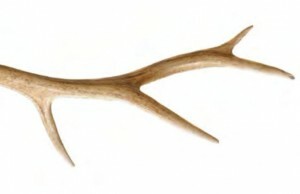 White “chalk” antlers are less valuable. Photo courtesy Dan Hoard. The reliance on global customers exposes the antler market to global forces. The 2014 dockworkers’ strike in California left bundles of antlers stranded on the west coast. When China’s stock market caved in August 2015, the antler distribution took another hit. “We’re sitting on so much antler right now because of the Chinese market,” says Hoard. Those stacks of antlers come from a mix of recreational shed hunters and others who are more profit-driven. 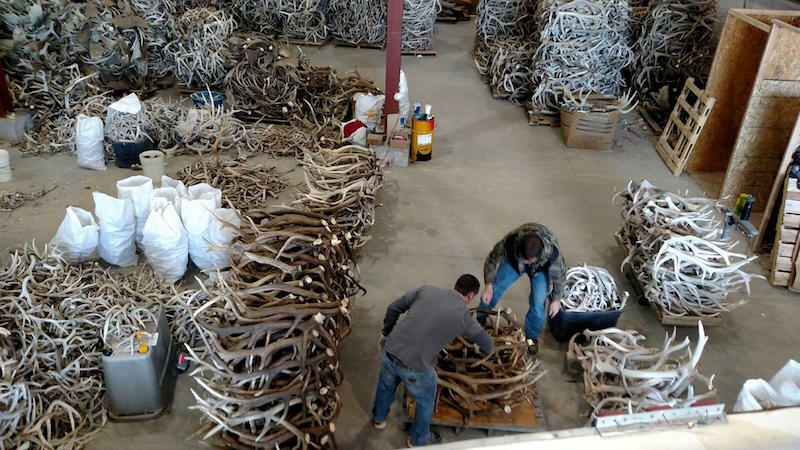 Hoard describes one western Wyoming shed hunter who has sold three horse trailer loads of antlers to D and A. Even at a lower price of $10 per pound, three 7,000-pound loads would net the seller over $200,000. There’s real money changing hands in small western towns. Long-time shed hunters like Hart will continue to pick up antlers no matter the demand or price. He shows off a photo of ten antlers—five matched pairs from the same bull elk, meticulously tracked year after year. Those aren’t for sale, but “sometimes I’ve sold whoppin’ big antlers that I thought were ugly.” Antler value is as much in the eye of the beholder as it is in the market. Antler hunting used to be a solitary endeavor or, at most, a family activity. But in the last decade, it’s become something else. Increasingly, the biggest challenge for many long-time shed hunters is not finding antlers, but getting away from the crowds. Shed hunting is catching on. Antlers in an Idaho warehouse await shipping. Many will end up in Korea and China. Photo courtesy Dan Hoard. The boom in antler hunting spun out of a combination of factors. The higher price of antlers tempted new antler hunters into the field. Social media has revived and reinvented the storytelling tradition of shed hunting, with posts of glorious racks circulating faster than viral cat videos. When Utah imposed a season on antler collecting, more shed hunters crossed into western Wyoming to get their fix, increasing antler hunting pressure there. Public lands in Wyoming were buzzing with hikers, snow machines, and ATV’s in the winter months. Biologists worried about impacts to winter-stressed wildlife at a time when mule deer were in decline throughout much of the West. “We were seeing quite a few people running around, really pushing the deer, in some cases running them with dogs, or running them until their antlers fell off,” says John Lund, Pinedale Region Wildlife Supervisor for the Wyoming Game and Fish Department. Those were extreme cases but the sheer volume of even well-behaved shed hunters was having an impact. In 2009, the Wyoming State Legislature responded by granting the Wyoming Game and Fish Commission authority to create a season for antler hunting in western Wyoming. The Game and Fish department now enforces a January 1 through May 1 ban “for the purpose of minimizing the harassment or disturbance of big game populations on public lands west of the Continental Divide…” Even looking for antlers during the seasonal closure is illegal, a tricky thing to enforce. Has the state’s experiment with an antler season in western Wyoming been successful? It depends on whom you ask. Midnight on the evening of opening day is like New Year’s Eve in the wide open spaces of western Wyoming. Trucks and ATVs line up along public land boundaries, lighting up snow and sagebrush. At 12:01 a.m., shed hunters dash into the night to snag antlers they’ve been glassing for days. On May 1 of this year, five individuals were swept downstream after their boat capsized in the icy Gros Ventre River during a midnight race to find sheds on the Bridger-Teton National Forest. The boaters were rescued but a packhorse drowned in the fray. Not surprisingly, many shed hunters don’t favor the seasonal restrictions. Other winter uses of public lands are not similarly banned so some shed hunters feel singled out. Lund says if there isn’t a full winter closure for an area, people can still hunt coyotes and rabbits, hike, and drive into winter ranges. In addition to creating a frantic opening day, the winter closure sends a wave of would-be antler hunters further east in the state where there is currently no seasonal restriction. And horn hunters from southwest Wyoming head south into Colorado during March and April, says Kim Olson, game warden from Baggs, Wyoming. Seasonal restrictions also create ideal conditions for poachers who don’t compete with a growing cadre of skilled antler hunters if they pick up antlers early and illegally. In just 2015, the Wyoming Game and Fish Department issued citations or warnings to 14 individuals caught collecting sheds out of season in western Wyoming. Fines averaged $300 and one person lost hunting privileges for two years. For non-hunters or out-of-state hunters who might not draw a tag, loss of hunting privileges is less of a consequence, especially when the financial gains can be so great. After six years of regulated shed hunting in western Wyoming, and mostly thanks to some mild winters and good precipitation in between, mule deer populations are doing better. “Overall, I think there’s quite a bit of support for [the antler season] and we do feel like it has been working,” says Lund. Still, the seasonal regulations continue to polarize recreationists in Wyoming. A petition is circulating among antler hunters to repeal the antler season. At the same time, other horn hunters are petitioning Wyoming legislators to expand the season to more of Wyoming. The pro-regulation contingent seems to be pulling ahead. Some lawmakers are proposing that the Wyoming Game and Fish Commission should be authorized to set a limited season for antler hunting statewide. In a regulation-averse state like Wyoming, the interest in seasonal restrictions speaks to just how big shed hunting and its associated impacts have become. 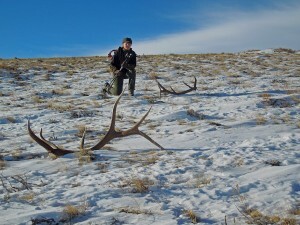 As long as there is demand for brown antlers, shed hunting will continue in the West. 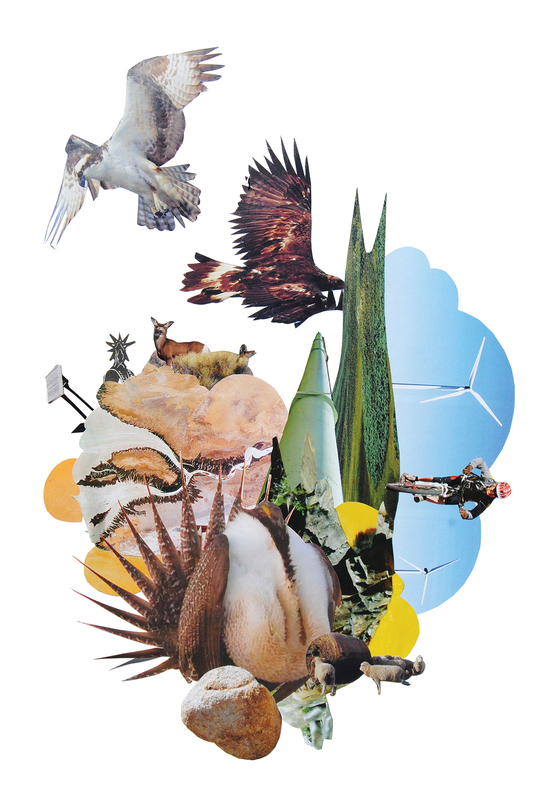 Add to that the many other increasingly popular winter recreation activities that take place on public lands, and it’s clear that conflicts with wildlife aren’t over. But at least the seasonal restriction forces the tidal wave of antler hunters to crash after most wildlife has departed for summer range, protecting animals on winter range as it is meant to. 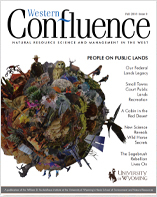 Nicole Korfanta directs the University of Wyoming Ruckelshaus Institute of Environment and Natural Resources, publisher of this magazine, and is Western Confluence’s Associate Editor. This article was well written and spoke of the Pro&Cons of shed collecting and animal stress from human intervention in early spring. 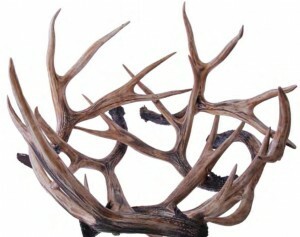 I’ve been collection antlers for over 25yrs.now and look forward to each new Spring. Their has been a large increase in people on the Wintering grounds of the Elk,Deer and Moose here in Colorado. The impact of Snowmobiles,ATV’s and humans has pushed the animals harder and sooner in the spring then natural migration. I’am not a Fan of more regulation and laws but common sense seems to be missing here in balancing whats best for the wildlife and human recreation.I donate back to the Rocky Mtn. Elk Foundation my capital gains from shed hunting less some gas and food expense. What comes from the ground can be repurposed back through a non profit to benefit it. One glaring deficiency in this article. IS the amount of trespass on private lands that occurs as a result of horn hunting. In my area landowners incurred significantly higher trespass and damage to lands and fences during spring by horn hunters than fall hunters. Many private landowners supported the season structure in western WY to get a handle on this. You’ve got that right Larry. The private property trespassing is ridiculous. I assume no one respects private property anymore when it comes to horn hunting season. There are foot prints and atv tracks all over our private land.